At Drake Law Firm, we have decades of combined experience handling all types of Birmingham car accident claims. Rear-end collisions, wrong-way crashes, intersection accidents, tire blowouts…no matter what type of accident you’ve been in, we can help. When you partner with Drake Law Firm in Birmingham, you’ll benefit from brilliant legal minds and skilled strategists at your service. Our lawyers will talk directly to insurance companies on your behalf, making sure claims adjusters don’t take advantage of you or get you to accept a settlement for much less than your injuries are worth. We have plenty of trial experience as well, giving you the option of taking a claim to court if necessary for the best outcome. Let your attorney work on financial recovery while you focus on physical recovery. We know we’re the attorneys to represent your car accident claim, but don’t take our word for it. Past clients of ours recommend us as a firm that resolves cases quickly and efficiently, is good at what we do, always treats clients with professionalism and kindness, and practices honest communication with clients. In addition, we understand the most common causes of car accidents in Alabama and know how to preserve and collect evidence to help our clients prove the other driver’s fault. Our lead attorneys and their associates work hard to not only meet client expectations, but to greatly exceed them with extraordinary results and experiences. After an auto accident in Birmingham, look no further than Drake Law Firm for legal assistance. Statute of limitations. One of the most important laws to know as a car crash victim is Alabama’s statute of limitations, or deadline for filing. Failing to file within the time limit will almost always result in the courts refusing to hear your case. You have two years from the date of your accident to make a claim. Contributory negligence rules. Alabama is somewhat unique in that it’s one of few states that still use a contributory negligence doctrine. This means that if the courts find you at all at fault for the collision – even by 1% – you lose the right to recovery. Hiring an attorney to advocate on your behalf can significantly improve your chances of avoiding contributory negligence. Compensation allowed in auto crashes such as mental anguish, lost wages, pain and suffering, etc. Recent changed and proposed changes to texting and/or using a cellphone while driving. Distracted driving has become a big topic. It seems like every day a report is made of a tragic accident caused by cell phone use. Alabama enacted a ban on texting in 2017. However, drivers still were using their phones with little or no resistance from law enforcement officials. During the 2019 legislative session, a bill has been proposed that would completely ban merely holding a cell phone while driving. The idea being that only hands-free use of a cell phone will be allowed. Guest Statute. Alabama law normally will not allow a guest or passenger in a vehicle to sue the owner/driver in the event of a crash. Our firm regularly finds ways around this by alleging reckless conduct or any of the other exceptions to this rule. We are a nation dependent on our cars. Cars are a convenience, a pleasure, and for many, a necessity, but spending a lot of time on the road in your car comes with a risk. In the United States, there are millions of car crashes and over 1,000,000 people are injured. Car accidents also kill between 30,000 and 40,000 people each year. They take a terrible toll in human life, and cause untold amounts of suffering—both emotional and financial—to families who have lost a loved one. Many of these car wrecks could be prevented. Too often they are caused by driver negligence—poor driving behaviors that results in loss of control, resulting in a collision. By eliminating negligent driving, we could reduce the number of traffic fatalities dramatically. If you or a member of your family has been killed or injured in an Alabama car accident, you know how a crash can turn your life upside down. Fortunately, there is help for the injured and their families. At the Drake law firm in Birmingham, we have a long history of making negligent drivers pay for the damage they’ve caused. In 2016, 1,058 people died in Alabama car accidents – 24.6% more than in 2015. A total of 152,532 vehicle collisions occurred in Alabama in 2016, causing thousands of injuries in addition to fatalities. 2019 statistics are not looking any better. If you or someone you love has suffered injuries in a car accident in Birmingham or elsewhere in Alabama, contact Drake Law Firm. Our lawyers can help you seek maximum damage recovery in the form of an insurance settlement or jury verdict. In the face of another driver’s negligence, carelessness, or recklessness, protect your rights with our help. Below are the top 10 types of vehicles that were involved in accidents in Jefferson County. Based on data from the NHTSA, typical drivers in Alabama have greater than one in three chances of involvement in an injury or fatal crash operating a vehicle over their lifetimes. The probability of individuals being in a crash of any severity during their lifetime is greater than 98%. Here are some statistics from the NHTSA. Alabama traffic fatalities totaled 852 in 2013, the National Highway Traffic Safety Administration (NHTSA) reports. 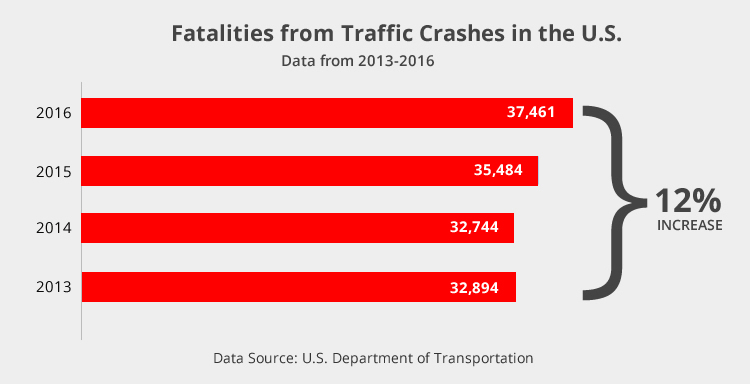 Car accident fatalities have been on a generally downward trend over the past decade, largely due to the safer cars on the road today. But the numbers are still in the tens of thousands, and a downward trend offers little comfort to the families who have lost someone they love. No one can bring your loved one back, but you can hold the negligent driver responsible for the wrongful death take responsibility and be held accountable for your loss in an Alabama wrongful death action. This and other highways in the state have taken all too many lives and caused all too many injuries. Many are caused by dangerous driving behaviors, including drunk driving, distracted driving, speeding, unsafe lane changes, and aggressive driving, among others. CarInsuranceComparison.com conducted a study that found Alabama roads and highways to be more dangerous than every other state but Florida and South Carolina. Many highway fatalities are caused by large commercial trucks, which cause untold amounts of damage when in a collision with a much smaller passenger car and are often the result of driver or trucking company negligence. Text message has become a favored means of communication among people of all ages, but texting and driving can be deadly. Writing or reading a text message while behind the wheel increases the likelihood of causing a wreck 23-fold, according to a Virginia Tech Transportation Institute study. As noted above, the 2019 Alabama Legislature has proposed a bill that would completely ban cell phone use while operating a motor vehicle. According to the bill’s sponsor, Alabama’s previous ban on texting has not had the desired effect on distracted driving. As the graph above shows, each year in the U.S. around 10,000 people die from alcohol related accidents. According to the NHTSA, there were 308 alcohol involved accident deaths in Alabama in 2013. Our state was the very last state to enact an ignition interlock law, in 2011. Worse, the law wasn’t implemented until 2014, when law SB 319 went into effect, finally implementing the program to incentivize the use of interlocks for all convicted DUI offenders. In 2012, Alabama reported 257 drunk driving fatalities— with a .08 blood alcohol content or above—totaling roughly 30 percent of the state’s total traffic deaths, according to M.A.D.D. (Mothers Against Drunk Driving). Impaired driving can also include prescriptions medications and illegal drugs. Head-on collisions are the most deadly of all traffic accident types. They comprise up only about 2 percent of all motor vehicle accidents, but they cause about 10 percent of all traffic fatalities. Head-on collisions are the most likely type of traffic accident to produce fatalities or devastating, life-changing injuries, including spinal cord injuries, brain injuries, amputations, organ damage, fractures, and burns. Drivers and passengers typically sit in the front seat of a car, so they are more vulnerable to a front end impact. Head-ons occur when a car drifts out of its proper lane or crosses a median to hit an oncoming vehicle. They may also occur when a driver enters a highway on the wrong ramp, traveling in the wrong direction. Some type of driver impairment is often involved, such as drunk driving, distracted driving, or driving when overly fatigued. Injuries occurring in head-on collisions frequently include ankle and foot injuries caused by braking before impact. Alabama ranked fifth in the U.S. for train collisions with cars and pickup trucks at railroad crossings in 2013. One primary reason is that many of the state’s crossings do not have warning gates. Railroad crossing accidents often occur because of malfunctioning or missing signals or barriers, brake failure, hand brake malfunction, defective communication equipment, or train operator error. Trains appear to be further away than they actually are, often causing drivers to misjudge the amount of time required to cross the tracks, so having working barriers and signals is essential to prevent a crash. Failing to install appropriate safety equipment, failure to adequately train operating personnel, and failing to maintain equipment in proper working condition may constitute railroad negligence, enabling the families of victims and those few who survive a railroad crash with injuries to recover damages from the railroad. Get the names and contact information of all drivers, owners, passengers, and witnesses to the accident. Call the police and provide them with the basic information about the accident, without unnecessary detail. Later, you should obtain a copy of the accident report from the police department. If you are injured, let the police know you need an ambulance. If you are able to do so, take photos of the accident scene, including all cars involved, showing the point of impact on each vehicle. Include street signs or other identifying features to identify the location of the crash. If you don’t feel you need an ambulance, you should still be checked out at a hospital emergency room, or by your own doctor or an urgent care clinic. Give a detailed description of any injury or pain, no matter how small. Some serious injuries aren’t apparent at first, such as certain brain injuries, complex regional pain syndrome, and herniated discs. These may not show up for days or weeks after the accident. Aches and pains that don’t seem very serious right after a car accident sometimes worsen with time. If they do, go back to the doctor immediately. Keep seeing your doctor as long as you have any symptoms at all. Do not comment about your physical condition (except to ask someone to call an ambulance). Do not give the adjuster a recorded statement or sign any paperwork, authorization, or release. Obtain regular and immediate medical treatment for the course of your post-accident recovery. Delaying medical treatment can be used against you by the insurance company. Call a seasoned Alabama auto accident attorney. The sooner the better. You can bet the other driver’s insurance company is out taking statements and preserving evidence. In Birmingham, the Drake Law Firm is a top choice for experienced legal representation. At the Drake Law Firm, you will receive the client-centered legal services that get you the results you want with the least amount of stress. We know personal injury law better than most, because it’s all we do—all day, every day. We have 30 years of experience to put to work for you. We know how insurance companies work, and how to overcome the obstacles they invariably attempt to throw in your path. We are superb negotiators who can usually obtain an excellent out-of-court settlement, but if need be, we are extremely effective in the courtroom and know how to present a thoroughly prepared and persuasive case to a jury. We have a long history of large recoveries, even in the millions of dollars, for our car accident clients. We are dedicated, diligent, tireless, and passionate in our commitment to justice. You will always work with your attorney in person, not be shunted off to a paralegal or junior associate. There is never a risk to you, because we front all the work and expenses of developing and preparing your case. You will never owe us legal fees unless we recovery money for you. Don’t attempt to settle your Alabama car accident claim on your own. This could put you at risk of getting next to nothing for your damages – or even nothing at all. If you’re dealing with broken bones, cuts and bruises, burns, whiplash, brain injuries, or spine injuries after a car crash in Birmingham, contact us. We’ll discuss your rights and potential legal opportunities during a free, no-obligation consultation with one of our lead attorneys. “Everyone at Drake Law Firm, both attorneys and staff, was always professional, kind, and helpful. I certainly recommend Drake Law Firm for anyone injured in an accident. You won’t be disappointed.” – R.F.